Solo travel is fantastic. Seeing new places is great. Combining the two together and you're in for a wonderful time. 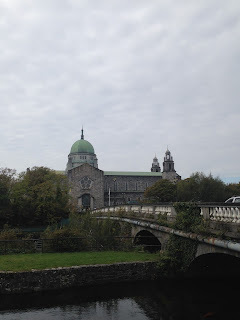 On Sunday I caught the train to Galway for a wee little day excursion. I haven't seen much of Ireland despite having been here for around 7 weeks, but Galway is by far my favourite place so far. The weather was spectacular, the cathedral is beautiful, the stores and waterfront are great areas to explore. I even went to an aquarium which was more like a glorified pet store as it lacked turtles, sharks or anything more exciting than seahorses. And to add to the excitement of a solo adventure to Galway, while I was there Ireland played France in their last pool match of the Rugby World Cup. The pub I watched it in called The Skeff was packed; standing room only which made for a great viewing atmosphere. There are a few places I want to go back to in Galway, so I will be making a return trip. Mostly to try some more of the cafes and restaurants the city has to offer. Food will forever have my heart.